The Memory of Azov Egg is carved from a solid piece of heliotrope jasper, also known as bloodstone, flecked with red and blue. Made in the Louis XV style with yellow gold rococo scrolls, set with brilliant diamonds and chased gold flowers, the broad flute gold bezel is set with a drop ruby and two diamonds clasp. The interior of the egg is lined with green velvet. 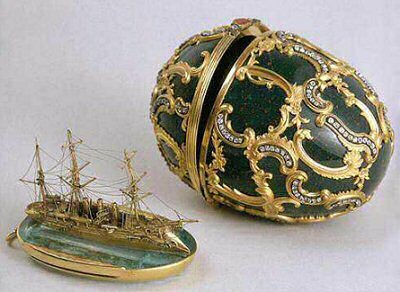 The Egg contains an exact replica of the cruiser Memory of Azov (Pamiat Azova) executed in red and yellow gold and platinum with windows set with small diamonds, set on a piece of aquamarine representing the water. The name Azov appears on the stern of the ship. 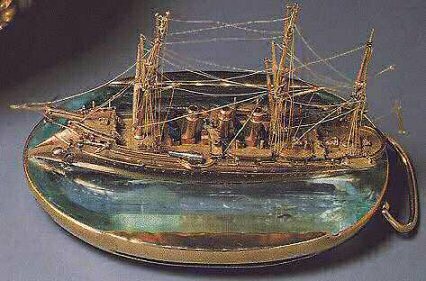 This Egg commemorates the voyage by the Tsarevich Nicholas and Grand Duke George to the Far East in 1890, made at the suggestion of their parents to broaden the outlook of the future Tsar and his younger brother. The voyage was a disaster because suffering from Tuberculoses George's condition worsened and Nicholas was attacked by a would-be assassin in a Japanese town and sustained a serious head wound. 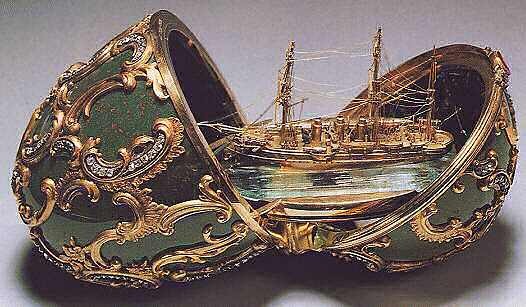 The Egg was presented to the Tsarina before these events occurred, and it never was one of her favorite Eggs. The Memory of Azov Egg never left Russia and is one of the ten Imperial Eggs in the Kremlin Armoury Museum in Moscow.